In June 2011, Looney Labs will re-launch the Icehouse game system, with great new packaging and a new headliner game, called IceDice. The previous edition, Treehouse, is now officially out of print. 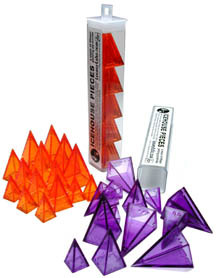 Until IceDice arrives, pyramids will be available only as replacement pieces, while supplies last, direct from Looney Labs. 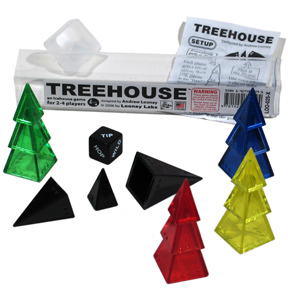 In 2006, we discontinued the boxed sets and the monochrome stashes and changed the entire way we sold and promoted the system, focusing on a new, much easier game called Treehouse, which required a lot fewer pyramids (plus a special D6). By releasing Treehouse in two color schemes (Rainbow and Xeno) we were able to keep all ten Icehouse colors available while only needing 2 product SKUs. It also provided an entry point for the system that was much easier to afford and understand. We updated our POP display to display mostly our card games, with a small slot for Treehouse. In 2008, we also released a special pink edition of Treehouse. Since color isn't important in the game of Treehouse, this allowed us to create a new color, and to test out the idea of packaging the game in the same kind of box we'd standardized our games around. Also, it was also a fun way of helping support an important cause, since 5% of proceeds from this special version were donated to Breast Cancer Research. 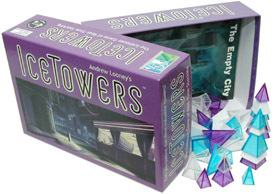 In 2003 we released fancy boxed editions of two of the most popular games at the time, Zendo and IceTowers. 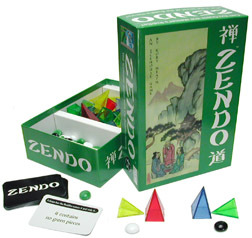 Zendo (The Icehouse Game with the Buddha Nature) came with 60 pyramids in standard colors, 60 glass stones (green, white, black), rules, 16 starter rule cards, and a pack of reference cards for other Icehouse games, called ICE-7. 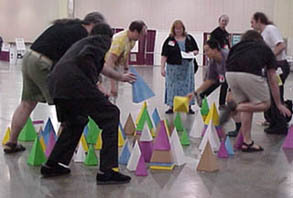 IceTowers (The Icehouse Game of Real time Stacking) included 60 pyramids in alternate colors, a copy of the new print edition of The Empty City, and a set of ICE-7 cards. NOTE: The last few copies of The Empty City are still available! We quickly outgrew the Martian Chess Set / Black Ice formula and decided to make pieces available simply as parts for a set you'd build yourself. 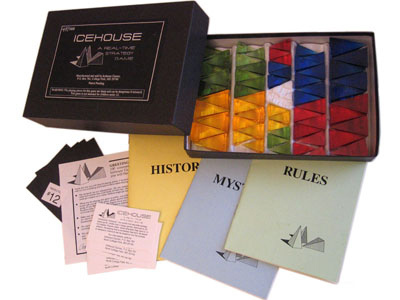 Icehouse Pieces were sold in 9 colors: Red, Yellow, Blue, Green, Purple, Orange, Black, White, and Clear Each tube simply contained 15 pyramids. 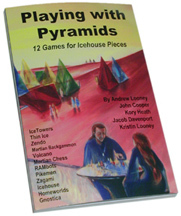 At the same time, we released a book called Playing with Pyramids, featuring complete rules for 12 games: IceTowers, Thin Ice, Zendo, Martian Backgammon, Volcano, Martian Chess, RAMbots, Pikemen, Zagami, Homeworlds, Gnostica, and the original Icehouse game. And PwP includes a lot of strategy sections, variations, background info, and diagrams, many of which appear only in this book. We created a POP display for our stores to display these products with our card games! NOTE: The last few copies of Playing with Pyramids are still available! ALSO: In 2006, a small run of gray pyramids was manufactured. They were briefly available in two forms: a classic monochrome stash tube, and as a set of Volcano Caps (i.e. just five Smalls). 8 times as big = 8 times the fun! We made a small run of these back in 2001 and sold most of them to fans, but we still use them to promote the pyramids at conventions. We finally made the first injection molded pyramids back in October 1999. 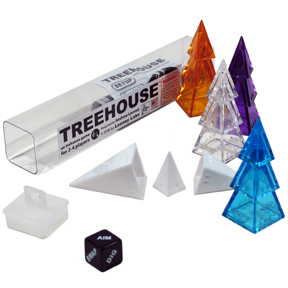 By then we'd started inventing other games for the pyramids; Icehouse: The Martian Chess Set included 3 rule booklets with rules to 4 games: Martian Chess, IceTowers, IceTraders (an early version of Homeworlds), and Zarcana. 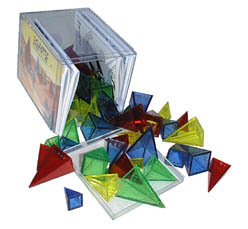 The clear plastic box included 60 pyramids in the standard colors: red, yellow, blue, and green. The following year we released expansion colors, black and clear, as a prodct called Black Ice. 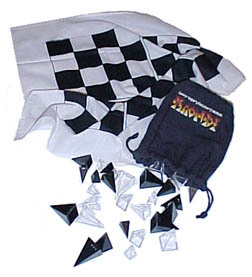 Also included were a hemp drawstring bag and a chessboard bandana with Martian Chess dividing lines. The Black Ice product did not include any game rules but did feature a little coupon which was supposed to be redeemable for a free copy of a booklet of rules that would eventually be created for the set. This coupon finally became valuable in 2007, when the 3HOUSE booklet was published, featuring rules for 3 games, one of which being the long awaited Black ICE. 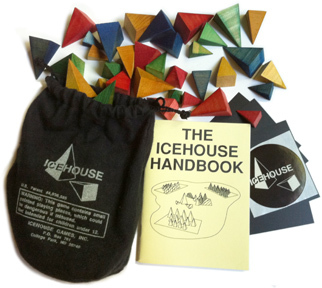 Using the fancy word Xyloid (which means "of or pretaining to wood") we released a deluxe Icehouse set with 60 factory cut, hand-stained wooden pyramids in a drawstring bag. We've lost track of how many sets like this were made, but it was only like a few hundred or so. The cost of making mass-produced plastic pyramids was impossibly high for us to fund back then, so we came up with a way of making pyramids affordable, out of thick paper. These die-cut cardboard pyramid kits actually produced a pretty nice set if you took the trouble of filling them with something like aquarium gravel and using white glue to seal the tabs into their slots. 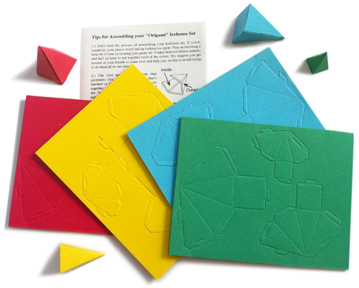 Like the Treehouse set, the original "Origami" version of the product came in two color schemes, Standard colors (shown here) and Neon (Purple, Orange, Lime Green, and Hot Pink). In the beginning, the only game was Icehouse. And it was imaginary. Then came handmade pieces and the first rules for a game for the system, which was as much like the game Andy had described in his story as his friend John Cooper could make it. 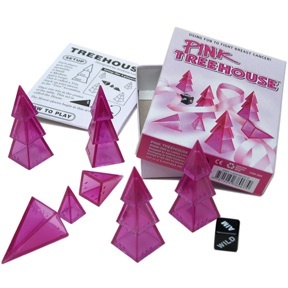 Then all their friends wanted to play, and Kristin wanted to start a game company, and Charles Dickson had a plan for making the pyramids, so in December 1989, they made and sold an initial test run of 100 Icehouse sets, packaged in stark black boxes. They made a few more sets in this style afterwards, but it wasn't practical to make homemade plastic pieces in large quantities, so this was a very limited edition.